1. any superficial inflammatory process involving primarily the epidermis, marked early by redness, itching, minute papules and vesicles, weeping, oozing, and crusting, and later by scaling, lichenification, and often pigmentation. Eczema is a common allergic reaction in children but it also occurs in adults, usually in a more severe form. Childhood eczema often begins in infancy, the rash appearing on the face, neck, and folds of elbows and knees. It may disappear by itself when an offending food is removed from the diet, or it may become more extensive and in some instances cover the entire surface of the body. Severe eczema can be complicated by skin infections. Childhood eczema may persist for several years or return after the child is older. Persons suffering from childhood eczema may develop another allergic condition later, most often hay fever or asthma. Cause and Treatment. Eczema is sometimes caused by an allergic sensitivity to foods such as milk, fish, or eggs. Inhalant allergens such as dust and pollens rarely cause eczema. Treatment involves the use of soothing baths, moisturizing creams, topical steroids, and oral antihistamines to alleviate itching. See also allergy. eczema herpe´ticum disseminated herpes simplex (see kaposi's varicelliform eruption). eczema vaccina´tum disseminated vaccinia (see kaposi's varicelliform eruption). (ek'zĕ-mă, eg'zĕ-mă, eg-zē'mă), Avoid the mispronunciation ecze'ma and the misspellings exzema, ecxema, and other variants. Do not confuse this word with exemia. Generic term for inflammatory conditions of the skin, particularly with vesiculation in the acute stage, typically erythematous, edematous, papular, and crusting; followed often by lichenification and scaling and occasionally by duskiness of the erythema and, infrequently, hyperpigmentation; often accompanied by sensations of itching and burning; the vesicles form by intraepidermal spongiosis; often hereditary and associated with allergic rhinitis and asthma. eczema herpe´ticum Kaposi's varicelliform eruption due to infection with herpes simplex virus superimposed on a preexisting skin condition. nummular eczema that in which the patches are coin shaped; it may be a form of neurodermatitis. xerotic eczema erythema, dry scaling, fine cracking, and pruritus of the skin, occurring chiefly during the winter when low humidity in heated rooms causes excessive water loss from the stratum corneum. A noncontagious inflammation of the skin, characterized chiefly by redness, itching, and the outbreak of lesions that may discharge serous matter and become encrusted and scaly. ec·zem′a·tous (ĕg-zĕm′ə-təs, -zē′mə-təs, ĭg-) adj. a general superficial dermatitis of unknown cause. In the early stage it may be pruritic, erythematous, papulovesicular, edematous, and weeping. Later it becomes crusted, scaly, thickened, or lichenified. Exacerbating factors include sudden temperature changes, humidity, psychological stress, illness, allergies, fibers, detergents, and perfumes. Eczema is not a distinct disease entity. See also atopic dermatitis, nummular dermatitis. eczematous, adj. 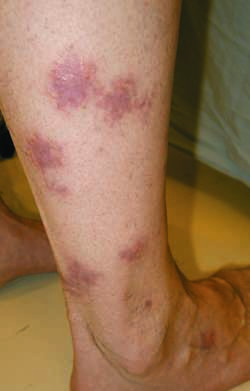 Generic term for inflammatory conditions of the skin, particularly with vesiculation in the acute stage, typically erythematous, edematous, papular, and crusting; followed often by lichenification and scaling and occasionally by duskiness of the erythema and, infrequently, hyperpigmentation; often accompanied by sensations of itching and burning; the vesicles form by intraepidermal spongiosis. Avoiding the cause of the rash (such as a sun-sensitizing drug; the leaves of the poison oak plant; an irritating soap or perfume, wool clothing, etc) prevents recurrences and allows the skin to heal. Locally applied astringent solutions (such as Burow's solution), antihistamines, or corticosteroid ointments, tablets, or injections may relieve the inflammation. Dry, pinkish, ill-defined patches with itching and burning; slight swelling with tendency to spread and coalesce; branny scaling; roughness and dryness of skin. This type may become generalized. Eczema marked by a thick, dry, inelastic skin with cracks and fissures. Eczema with thickening of the skin. Eczema marked by a raw, red surface covered with moisture. Follicular, impetiginous, or consecutive eczema including eczema rubrum, eczema madidans, eczema fissum, and squamous eczema . Eczema marked by a red, glazed surface with little oozing. The spreading of vaccinia virus to localized areas of skin, or to the entire body, in patients recently vaccinated against smallpox. This reaction is a rare complication of smallpox vaccination, occurring in about 40 per million of newly vaccinated individuals. It usually occurs in people with pre-existing eczema and is occasionally fatal. 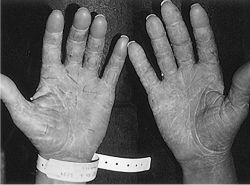 Eczema accompanied by the formation of vesicles occurring on the hands or feet. The effect of a number of different causes and a feature of many different kinds of skin inflammation (dermatitis). It features itching, scaly red patches and small fluid-filled blisters which burst, releasing serum, so that the skin becomes moist, ‘weeping’ and crusty. a blistery skin rash usually due to an allergy. A superficial type of inflammation of the skin that may be very itchy and weeping in the early stages; later, the affected skin becomes crusted, scaly, and thick. There is no known cause. n a skin condition characterized by irritated, dry, and itchy skin. Although usually triggered by an external agent, internal conditions such as poor nutrition, digestion, and circulation; excessive mucus; food allergies; stress; and environmental toxins contribute to eczema. Generic term for inflammatory skin conditions, particularly with vesiculation in acute stage, typically erythematous, edematous, papular, and crusting; followed often by lichenification and scaling and occasionally by dusky erythema; often hereditary and associated with allergic rhinitis and asthma. n an inflammatory skin disease characterized by vesiculation, inflammation, watery discharge, and the development of scales and crusts. The large variety of types can be distinguished according to location and causal agent. 1. a general term for any superficial inflammatory process involving primarily the epidermis, marked early by redness, itching, minute papules and vesicles, weeping, oozing and crusting, and later by scaling, lichenification and often pigmentation. see solar dermatitis. Called also Collie nose. Q. WHERE CAN I FIND A NATURAL TREATMENT FOR ECZEMA? I HAVE SUFFERED...I MEAN SUFFERED FROM SEVERE ECZEMA THAT LEAVES MY FACE SWOLLEN, BURNING, OOZING, ITCHY, DRY, CRACKED,STINGING. SOMETIMES MY FACE BLEEDS. I DARE NOT CRY BECAUSE TEARS HITS MY FACE LIKE BATTERY ACID. DOCTORS DO NOT HELP ME. THEY ONLY OFFER PREDNISONE AND THE SIDE EFFECTS ARE UNBEARABLE. SOMEONE,PLEASE HELP ME!!!! A. I HAVE SEEN TWO PROMINENT ALLERGY SPECIALIST WHO GAVE ME A BATTERY OF SKIN PATCH TESTS AND THEY COULD NOT HELP ME. SO THEY JUST REFERRED ME BACK TO DERMATOLOGY WHERE THEY ONLY KNOW PREDISONE AS A THERAPY. I'M JUST GRATEFUL THAT SOMEONE CARES AND RESPONDED. I AM OPEN TO OTHER STRATEGIES. THANK YOU. Q. do you have information or articles on skin eczema that is related to depression, especially in men? Skinfix Gentle Eczema Balm is infused with 2% colloidal oatmeal and healing emollient oils. If left untreated, severe eczema can cause lichenification, which causes the skin to become thick and leathery. Source of Data: The study comprised of 50 clinically suspected cases of lower leg eczema above 5 years of age who attended Dermatology OPD of the hospital (Vinayaka Mission's University), Pondicherry from September 2008 to September 2010. Twenty-four percent were diagnosed as having eczema, which was typically mild. The overall incidence of suicidal ideation was 11%, but 16% of adolescents with eczema reported suicidal ideation, compared with 9% of those with no eczema (odds ratio, 1. If food allergy does trigger eczema, it does it slowly, so it may take several days or weeks of restrictions and reintroductions of multiple, overlapping foods to figure this out. Even when eczema is under control you need to use emollients to keep the skin moisturised and avoid dryness. Children with eczema are prone to develop food allergies. Sun bathers can be prone to another type of eczema, such as the photo-sensitive eczema, which is caused by exposure to the UV (ultra-violet) rays. The medical name for eczema is atopic dermatitis, which reflects the immunological nature of the condition. It can be tough bringing up a child - and when that child has eczema, it just gets tougher. Analyses included a multinomial logistic regression model for early- and late-onset eczema versus no eczema through 60 months of age.